This is a description of how the mapping scale and placement works for a battle. At the end is a link to a program that uses these equations and will automatically make an annotated map of any objects you want to see. First, unpack a map and go to the bf1942\levels\somebattlename directory for the battle. We'll use the bf1942\levels\Anzio files as an example. coord_x = letter "A" + integer(0.4563 * 8) = "A" + 3 = "D"
So this base is at D6, which is indeed the case, and can be confirmed on the map at the end of this page. The Perl program makemap.zip uses this conversion process to create annotated maps of any battle in Battlefield 1942 or total mod (currently "Desert Combat" and "Eve of Destruction" are supported, but the program is easy to extend). What this program does is to read in object data and minimap from a level and create an overhead map at a user-specified resolution, annotated with icons as desired. Spawn points, flags, repair pads, ammo boxes, and other data can be displayed. The program also dumps the coordinates of all objects found in the scanned files. As an example, the Secret Weapons maps at the PlanetBattlefield Intel site were made with this program. The output map is in .PPM format, which can be read by the free Irfanview image viewer, among others. I recommend converting this output PPM file to 24-bit color PNG, as GIF has too few colors and the icons will often change horribly, while JPEG will blur the icons. Install a Perl distribution, if you do not have one. ActiveState's Perl Distribution is free and high-quality. Extract the makemap.zip files to some directory, say C:\perlprogs. Extract the level's .rfa file you want to map to a directory. This is done by using the MDT's winRFA.exe program, at C:\Program Files\EA GAMES\Battlefield 1942\Mod Development Toolkit\Tools\RFA Tools\winRFA.exe and opening up a level .rfa file, for example C:\Program Files\EA GAMES\Battlefield 1942\Mods\XPack1\Archives\Bf1942\Levels\Anzio.rfa. You'll also, in this example, want to unpack Anzio_003.rfa afterwards; this is a patch file that should be overlaid on top of the original unpacked files. Open up a command prompt window. Click "Start | Run..." and type "cmd.exe". In the command window go to the directory where you extracted the data (e.g. "cd C:\bf1942extract\Bf1942\Levels\Anzio"). The data will stream by instead of getting stored in a file. At the end, Anzio2.ppm is created. Note that this is a different map name; the "2" comes from what the "$mapscale" variable is set to inside the program, if not equal to "1". Other than the options and comments changed at the tops of the files, makemap.pl and makemap_full.pl are identical code. By default, the program searches the Conquest directory for the object spawn files, and also includes any Objective Mode objectives. You can map other types of battles, by setting "$battletype" to "objectivemode" or "singleplayer" or other battle type; see the top of the program for more options. 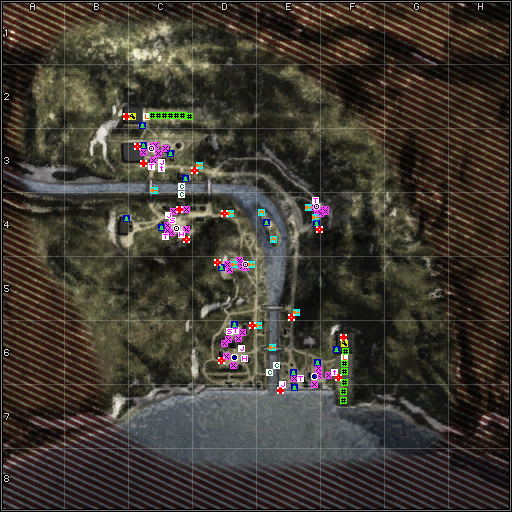 If icons overlap, they will be normally be shifted in a reasonable manner so that their overlap is minimized and they are all readable (actually, soldier spawn icons are ignored in this process, since they are so numerous and relatively unimportant). This option can be turned off, and icons can be made semi-transparent so that it is clearer when two icons overlap. There are a number of other options available, such as the output map size, icon transparency, etc. ; again, read the documentation at the top of the program. It is also fairly straightforward to edit the program to scan for other types of objects (say, all the trees) and display their locations, and to add new icons. i.e. the icon drawn is changed. The minimap file reader in this program is fairly elaborate, reading in a fair assortment of DDS format files. If you get incorrect results for the output map, such as strange colors or bands, it is likely that the minimap (textures\ingamemap.dds) is in a DDS format that is not supported. Here is a sample custom map, of Anzio, with all objects shown and with shifting done so all icons are visible.